We have had the opportunity to acquire significant and in-depth data on trunk disease symptoms in nearly 30 grapevine cultivars (“varieties”). These results will be the focus of the viticulture workshop at James Arthur Vineyards. University of Nebraska Viticulture Program research will be featured, along with observations and published information shared with the UNVP personnel by Richard Smart (“the Flying Vine Doctor”) earlier this year. We also will provide inputs from University of Nebraska Plant Pathology diagnostic personnel regarding Botryosphaeria and Eutypa, their characteristics and management. Examples of various stages of trunk diseases will be available for participants to inspect. In addition to the focus on trunk diseases, attendees will gain insights and advice regarding Post-Harvest Vineyard Management, including disease and insect management, vineyard clean-up and practices that will make your vineyard ready for winter and the next year’s vintage. These tailgates will provide the opportunity to see the impact of the pruning efforts that took place at the first installment of the series and what was observed at the second session (fruit set stage). It is anticipated that the vines that we are following throughout the growing season will be at veraison, or perhaps in some cases approaching harvest maturity. Please note: you do not have to have participated in either of the first or second tailgates to attend one of these third tailgates. We will review what took place at the first and second tailgates and evaluate the vines at this stage of development. We’ll also discuss what vineyard tasks need to be addressed at that time and stage of vine development. JUNE 23, 2018: GREAT EDUCATIONAL OPPORTUNITY WITH RICHARD SMART! Richard Smart, a.k.a. “The Flying Vine Doctor” will be in Nebraska on June 23 for an educational program sponsored by the University of Nebraska Viticulture Program and the Nebraska Winery and Grape Growers Association (NWGGA). Consulting opportunities will be available and details of the educational program (topics, location and time of day) will be announced in the Nebraska VineLines and on the University of Nebraska–Lincoln Viticulture Program’s web site. Our goal of evaluating the impact of our pruning efforts at our first installment of the Serial Tailgates on flowering has come and gone because of the high heat experienced recently (the duration of flowering was unusually short). However, we can examine the impact of both the first installment treatments and the heat on fruit set and discuss what impact this rapid period of flowering had on projected yield/crop estimation. This will be a good time to also discuss disease management and how the recent weather experienced has impact on spraying decisions. We will plan to have a third installment of our “Serial” tailgates at veraison later this summer. PLEASE NOTE: You do not have to have attended one of the first tailgates to attend these second tailgates. We will catch you up on what took place at the first ones and provide insights into the relevant grapevine management strategies. We hope to see you at Miletta Vista Winery or James Arthur Vineyards on June 12 or 13, respectively. You will learn a lot and have the opportunity to interact with colleagues in the Nebraska grape and wine industry. SEE YOU THERE! When? Monday, February 26, 2018 at 4:30 pm – feel free to arrive later as your schedule allows - we expect to continue until 6:00 pm or later. When? Wednesday, February 28, 2018 beginning at 4:30 pm – feel free to arrive later as your schedule allows – we expect to continue until 6:00 pm or later. The University of Nebraska Viticulture Program is sponsoring the first in a series of regional tailgates on Monday, July 17th from 4:30 to 6:30 pm at the Ron Heskett farm, 72653 646 Ave, Nemaha, Nebraska. Heskett is the owner/winemaker of Whiskey Run Creek Vineyard and Winery and the producer of many award-wining wines. His vineyard offers the opportunity to evaluate trellis systems, canopy management, fruit set, crop estimation and many other important vineyard management issues. These “tailgates” are modeled on Cornell University’s tailgates for the Finger Lakes region grape growers. The tailgates will present timely topics and updates with an in-the-vineyard approach to practical problems and solutions. It will also afford participants a chance to discuss challenges and opportunities and to interact with fellow growers and University of Nebraska Viticulture staff. Location and dates of future tailgates will be announced soon. Watch your email and the University of Nebraska Viticulture Program and NWGGA web sites for these tailgates in your region. Although we refer to these as “regional”, all are welcome who may be interested. This is FREE event. For further information, contact Paul Read (pread@unl.edu; 402-472-5136) or Steve Gamet (sgamet@unl.edu; 402-416-9763). We’ll look forward to seeing you there. Register NOW for the Northern Grapes Project Webinar Series final webinar to be held on Tuesday, May 9th, 2017. Matthew Clark, John Thull and Jennifer Thull from the University of Minnesota will present Introducing Itasca – Minnesota’s new cold-hardy white wine grape. Webinar information is at http://northerngrapesproject.org/northern-grapes-webinar-series. Read the entire article in the March 2017 Nebraska VineLines. “Recipe to Reality” seminar at the University of Nebraska Food Processing Center will be on April 1, 2017. Pre-registration is required and space is limited. Registration deadline is March 15, 2017. Contact Jill Gifford at 402-472-2819 or jgifford1@unl.edu for an information packet. The Northern Grapes Project provides monthly, one-hour webinars covering topics on growing, producing and marketing wines made from cold-hardy Northern winegrape cultivars. The final webinar for this academic year will be April 11, 2017. Webinar information is at http://northerngrapesproject.org/northern-grapes-webinar-series. The Fall Workshop was held on Nov. 5, 2016 at the Southern Heights Presbyterian Church, corner of Old Cheney Road and S. 40th Streets, Lincoln, Nebraska. Problems associated with herbicide drift and volatilization and the impact on Nebraska and Midwest vineyards was the primary focus of this workshop. Sponsored jointly by the University of Nebraska Viticulture Program and the Nebraska Winery and Grape Growers Association, topics included discussions on whatsteps to take if a drift event has impacted your vines, possible remedial measures and the roll of the Department of Ag and what they can do for you. This was an especially timely event—be sure to review the presentations! The time of the year that we’ve all been waiting for and working toward is either rapidly approaching or now upon us. Many Nebraska vineyard managers are looking at a good-to-great crop. Unfortunately, a few have vineyards that have been decimated or destroyed by hail or wayward herbicide drift, and to those we offer condolences with hopes for a better year in 2017. Read more. This is the link to the 2015 Presentation by Patrick Laird. To provide clarification about cultivars (“varieties”), we list several under each category. Even with a heat index of 105 plus degrees on July 11, 40 people attended the Eastern Nebraska Viticulture Field Day at Eric Nelson's Oak Creek Vineyard near Raymond, Neb. Vineyard Manager Scott Dvorak and University of Nebraska Viticulture Program Professor Paul Read, Research Technician Steve Gamet, and Doctoral Student Ben Loseke hosted the event. Read more. Check out the latest Northern Grapes Project Newsletter! Highlights include articles on wine tannins, impact of spring frost damage in Michigan, and results from the Northern Grapes Project Baseline Survey. Plans are going forward to negotiate returning to the Omaha Marriott for our 19th Annual Winery and Grape Growers Forum and Trade Show March 3-5, 2016. Although plans are not totally firmed up as of yet, we recommend that you save the date: MARCH 3-5, 2016. Famed enologist, Dr. Murli Dharmadhikari, headlined the wine and winemaking part of the 18th Annual Nebraska Winery and Grape Growers Forum and Trade Show held at the Omaha Marriott, March 5–7. Jerry Lohr, South Dakota native and owner of J Lohr winery in California, was the Awards Banquet speaker. Doniella Winchell, Executive Director of the Ohio Wine Association, spoke in the marketing and promotion arena and Andy Allen, Chair of the Viticulture and Enology Program at Arkansas Tech University, was the featured viticulture speaker. Each of these speakers are well known to the Midwest grape and wine industry. The 2013 Harvest Field Day at Kimmel Orchard in Nebraska City was a great success. The 30 attendees enjoyed great weather, lunch and conversation. Dr. Read did informative presentations on "Crop Estimation and Adjustment", "How To Use A Refractometer to Measure° Brix", and "Canopy Management." There was also a lot of discussion on Herbicide Drift, how to recognize it and what to if you observe it in your vineyard. The success of the workshop has to be the participation in discussions with all the attendees, their great questions and input made it one of our best Field Days. 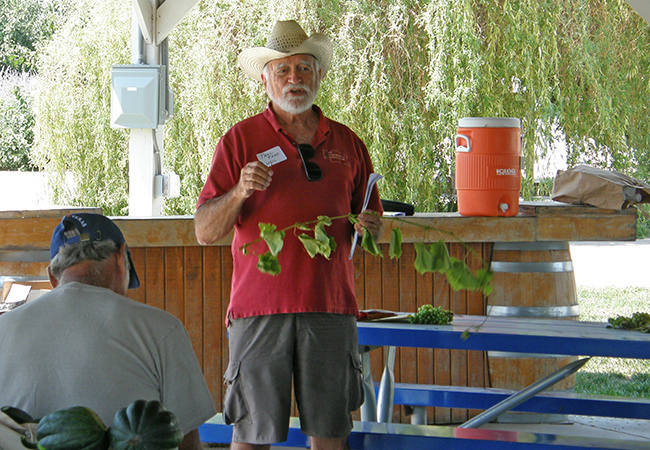 Dr. Paul Read, University of Nebraska–Lincoln Professor of Viticulture, addresses the Harvest Field Day attendees at Kimmel Orchard in Nebraska City on August 10. 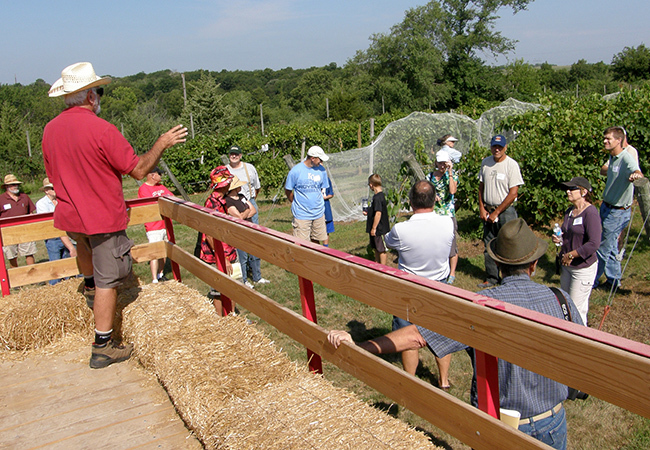 Dr. Paul Read explains the history, layout and research of the Kimmel Research Vineyard at the 2013 Harvest Field Day. As the vineyards are becoming a new addition to the beautiful Nebraska landscape, Nebraska Winery and Grape Growers Association started a resourceful newsletter for our new "vineyard neighbors". They are giving us a written tour of the new landscape, and providing a lot of tips for the growing season. Our readers can enjoy this delightful newsletter by clicking on the link: Living Near A Vineyard 1. The U.S. National Wine Competition is open for entries! This competition focuses on all U.S. grape varieties (native, hybrid, vinifera) and regions. The deadline to enter has been extended to March 28, 2013, with judging on April 9-10, 2013. For details, visit the website at: http://www.winecompetitions.com/ and click on the red, white and blue US Wine Competition logo. The 16th Annual Nebraska Winery and Grape Growers Forum and Trade Show was held at the Kearney Holiday Inn from Feb. 28-March 2, 2013. Examine Site Conditions Before Embarking in Viticulture by Dr. Paul E. Read. Foliar Fertization of Grapevines by Peter Christensen, University of California, Kearney Agricultural Center. I am posting comments that Mark Hart and Peter Hemstad made to the Minnesota Grape Growers listserv. I feel that they are right on target, so rather than paraphrase their comments, I am putting them on our web site as they have sent them (with their permission). Peter asked that I include a caveat that his comments are not aimed at the bud break delay work that Seth McFarland and our grad students (Issam Qrunfleh and Ben Loseke) have been doing, which he considers good work. I suggest reading Mark's and Peter's comments and take them to heart. Happy Frost Dodging and best wishes for a bountiful crop! I had a couple inquiries in private about frost protection that I think stemmed from things I and others have said in the group. The first item would be frost protection using cryoprotectants, or products you spray on a vine prior to a frost event that are supposed give the vine extra protection during a freeze event. The short answer is that there is little evidence from scientific trials that these work. The way a scientific trial works is that the products of interest are compared side by side during a real freeze event and compared to control vines in the same location that have had no treatment. As you might imagine, these studies are a little hard to do, the research has to be set up and waiting for a somewhat rare event to occur. Since each freeze event is different in its nuances (duration, rate of cooling, humidity, etc. ); the results seen in one set of circumstances might not be the same in a different freeze event. The field studies that have been done mostly show little positive benefit from these products. There are very few recommendations to use these products from the research/extension community. How can this be? If you go to any vendor/mfg website they are full of charts and graphs and testimonials about the positive benefits of their product(s). Because real world freeze events are rare, most vendors test their product on potted plants in freeze chambers. Those conditions do not mimic what is seen in the real world, and products that have performed well in these controlled conditions have rarely had similar performance in the field. Humidity in control chambers (and California) is generally much lower than what we see in the Midwest during freeze events. Every time I track down the details behind the testimonials, very few of the growers left a control area in their planting that was untreated, so the comparison the grower uses to evaluate the performance is to prior freeze events or to other growers in the general area. Again the variability between events and locations makes evaluating success on these bases pretty tenuous. If you Google search these products you will often find many examples of growers reporting failures - those don't show up in the marketing material. If a grower applies one of these products, I strongly encourage them to leave a few representative vines (same variety, same frost exposure) untreated so that they can compare apples to apples when evaluating effectiveness. There is some science that shows that plant tissue has different freeze tolerance based on its condition, and that those conditions might be able to be changed by adding something from the outside - so there is science that fosters hope for effective products, but field trials suggest that does not translate well to growing situations. Another aspect is spraying vines with cryoprotectants prior to bud break. This really is moving further from reality. IF these products worked, the basis is usually that the spray gets absorbed into or onto the green tissue to protect it in some way. Prior to bud break, there is not direct access to the green tissue, a product would have to be absorbed in some way to even have a chance of success. Dead bark and bud scales are very effective at NOT allowing that kind of absorption. That is why they are effective at protecting the plant tissue. We spray systemic herbicides (like Roundup) on our vines at this time of year. If those herbicides were absorbed through the bark, the vines would die. Those sprays use all types of surfactants which would enhance absorption, but the vines survive. Any cryoprotectant you spray on a vine before there is green growth is going to have the same degree of absorption. The other issue I want to discuss is site selection. If you go to an area like Europe where they have grown grapes for 100's of years, you will notice that vineyards are primarily in places that minimize the frost potential. Success and failure (selection) have worked over time to produce that pattern. In the North American Midwest our industry is young, and I don't think the site selection lesson has sunk in in our industry yet. As I look at the temperature reports come in I see some vineyards report temperatures that are 5-8 degrees above or below the temps recorded at the nearby airport station. Airport stations are usually flat locations that are neither in deep valleys or ridgetops and have an average temperature for the surrounding area, so that suggests that within a fairly small geographic region there is about 5-10 degree variance in the overnight lows that are encountered. Growers need to exploit these mesoclimate variances and locate vineyards where the frost risk is low. Site selection is the number one tool in frost avoidance. Once you have a vineyard in place, planted at a cost of $10-15K/acre, it is very difficult to decide to move, so site selection really needs to be impressed on potential growers at the start of the process. Hope everyone gets through the cold. I would just like to encourage everyone to take Mark's comments to heart because I think he is absolutely correct with his analysis of the situation. Cryoprotectants are unproven and are unlikely to work. Growers who swear by them have very seldom left any untreated vines as a control. Without a control you have no idea if your buds survived because you sprayed them with a particular product or if they would have survived anyway. Mark's comments about site selection are also right on the mark. Site selection is by far the biggest factor in whether you are going to have frost issues year in and year out. If you are planting a few vines as a hobby then plant them wherever you want. But if you are planting a commercial vineyard then you really need to optimize your site selection. Basically that means plant them on high ground or don't even plant them. It's as simple as that. Here at the HRC we are on high ground and we have had very little frost damage over the past 25 years. I can thank whoever picked this site back in 1908 for that! The only frost damage we ever really run into is on the very lowest parts of our vineyards, areas I was reluctant to plant into to begin with because of their potential for frost problems. This past week we had a low temp of about 24 degrees on both Monday and Tuesday nights and fortunately almost all our buds seem to have survived. If you have a good site you can rest a lot easier when these frost episodes arise. The mild winter and unseasonably warm weather may bode ill for the Nebraska grape and wine industry. Early bud break can produce shoots from primary buds that are extremely vulnerable to damage if a cold temperature (frost or freeze) event occurs. Of course we all know that we can't alter Mother Nature/weather characteristics, but I thought repeating some information that has been presented at various workshops, conferences and elsewhere might be helpful. The potentially serious problem noted is not just worrisome to Nebraska growers, but the possible problem of early bud break followed by a cold weather event is of great concern in most of the East and Midwest, since similar weather patterns are being experienced throughout the region. Some of our growers are familiar with the work of Dr. Imed Dami (now at Ohio State University) and his colleagues where they have used sprays of a vegetable oil product (Amigo Oil) to delay bud break. In their work, 'Concord' was the most responsive, while the response of other cultivars to Amigo Oil applications varied greatly depending upon cultivar. Research work done at University of Nebraska–Lincoln by recent PhD student, Issam Qrunfleh has demonstrated bud break delay in 'Edelweiss' of from 5 to 7 days resulting from sprays of 10% Amigo Oil or 1,000ppm NAA (naphthaleneacetic acid). 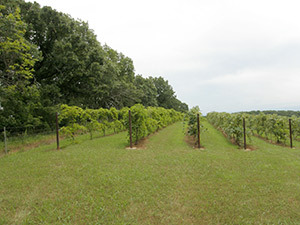 Likewise, Seth McFarland at Mac's Creek Vineyards has achieved good bud break delay by use of sprays of Amigo Oil on the Mac's Creek Vineyard grapevines. A synopsis of Dr. Dami's work and that of others, along with some additional observations has been sent to New York growers by Hans Walter-Peterson, Cornell University viticulture extension specialist, in which he addresses these concerns. I am attaching his write-up in hopes that it will be of interest to Nebraska growers and others accessing the University of Nebraska Viticulture web site. Additionally, the proceedings of a conference held in Missouri following the disastrous Easter Freeze of 2007 can be accessed here. Perhaps we will be lucky and not experience extremes of damaging cold following an early bud break, but I'm not holding my breath. If such problems occur, some of the information noted in the Missouri proceedings will be helpful. Please feel free to call or send emails to further discuss this potential problem facing our grape and wine industry. Good luck! Attendees at the Machine Harvest Field Day at Ida's Vitas Vineyards on September 19th were heard to say "you need to see this machine in action to really appreciate how effective it is, how it actually works!" The South Platte Grape Growers demonstrated the Korvan 3216 grape harvester to an appreciative audience that learned about the advantages (and challenges) of machine harvesting, including labor saving and timeliness of harvest.